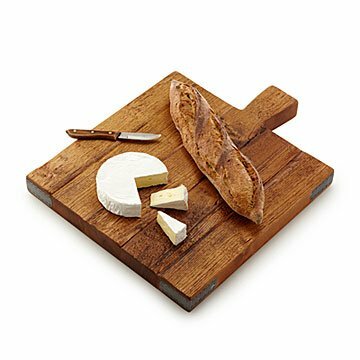 Give your kitchen a vintage touch with this reclaimed Hungarian wood serving board. Had you attended a dinner party in 19th century Hungary, the menu may have included chicken soup, stuffed cabbage, and butter-cream tortes. Give dinner parties or your kitchen assortment a bit of historic charm—the menu's up to you—with this reclaimed wood serving board. Artisans use authentic 19th century Hungarian hardwood to create each rustic piece. Chop, cut, or serve guests in style, or give one to the newlyweds as a wedding gift. Handmade by artisans in Hungary. 19.5" L x 15.5" W x 1.5" H; 12 lb. Wash with mild soap and water. When dry, help condition and preserve your Reclaimed Wood Serving Board with mineral oil.